Chris this rocks, his face has quite the story to tell, I love it. 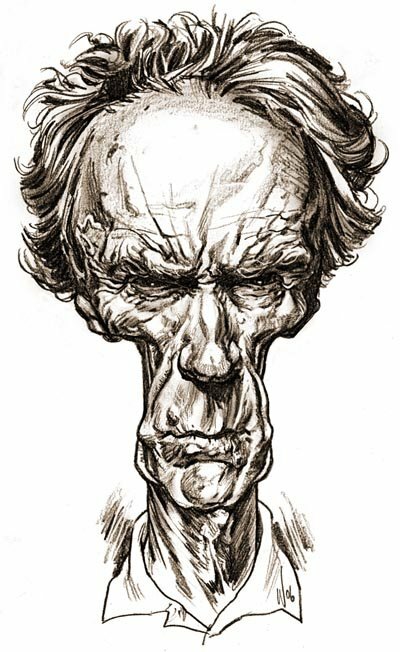 I am currently working on my Clint painting, working up ideas and all, what a cool face. Awesome textured wrinkled face. Love it! like rock and bark - all at once!!! awesome!!!!!! this is amazing. so creepy, and so funny. Your work is excellent. I'm glad I found this blog. This has got to be my favourite caricature so far mate. I love the fact that his skull seems to be at war with his face...and the skull has started to win. Perhaps this 'war' is a metaphor for the aging process. In any sense it's a work that inspires thought. This is superb, Chris! 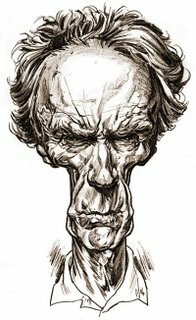 It's way out there and yet it really captures the essence of Clint! looks more Clint-like than Clint! Awesome! Thanks everyone for your generous and encouraging comments. Always appreciated. Anonymous- Bob Barker? Not too familiar with him over here in Oz. Game show host, right? Jason Seiler- Very much looking forwrad to seeing your rendition. Man, that is just brilliant Chris. Thanks heaps to the both of you! Fantastic work and superb Blog ! Thanks Andrew! Love the 3D work on your blog.